This is the best I can do. The fact that I am even changing out of my sweat suit (sweat pants + sweat shirt) to leave the house is at this point a miracle. And we don't even have snow on the ground here like some of you do… so sorry for my empty whining. Ok, I'm going to go lure the pugs to warm my feet again. The silver lining? J.Crew sale is an extra 40% off now! Stock up!! I'm crushing on this elbow patch sweater, floral dress & new work pants. what an adorable scarf! Ah i love j crew! oooh i did not know j crew has a slae going on!!! now that is definitely a silver lining! Great look! I love your bag! I feel ya on the weather, we got a bunch of snow yesterday & I'm just so over it! I am NOT a camo girl but that scarf is too cute Jess! Love this outfit! that scarf is so pretty! oh I'm such a sucker for JCREW! So cute my darling! 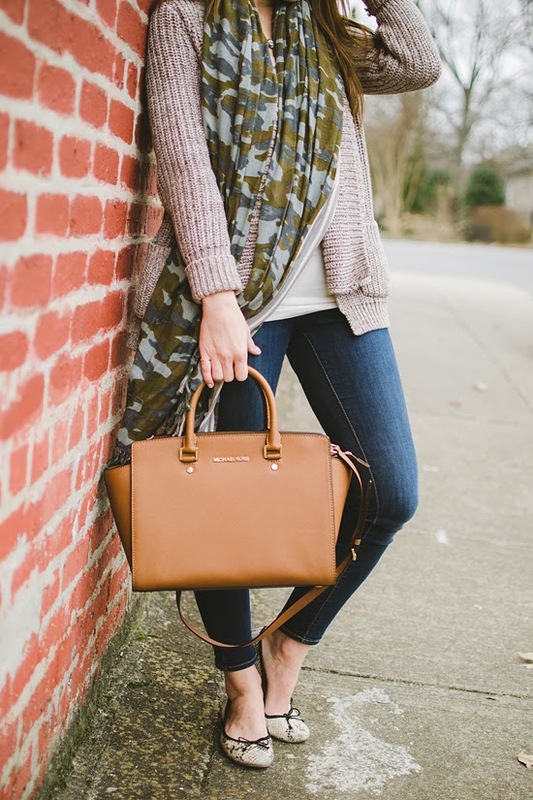 I LOVE the layered look here, especially with that scarf! I am right there with you! We never got snow in Charleston, so sometimes I feel like my complaining isn't warranted, but it's 39 degrees in the middle of March! So over it all. 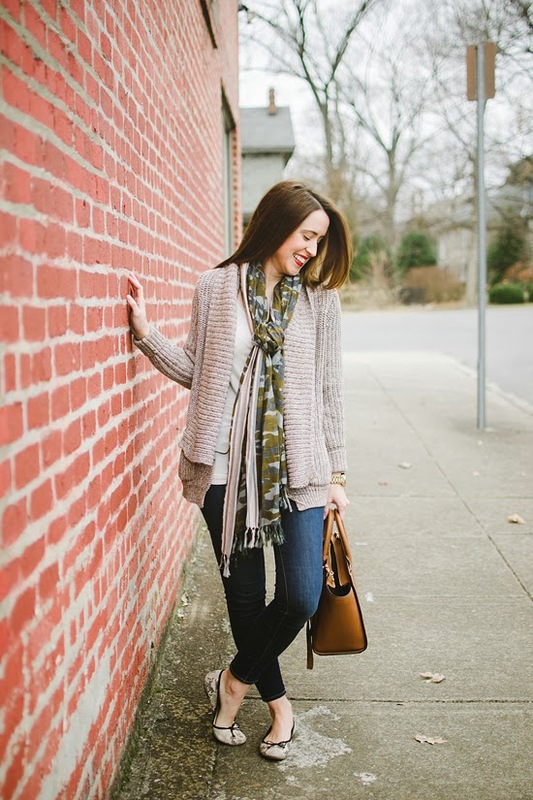 Love this look--that cardigan is amazing! What an awesome scarf! This look is casual yet chic, love it! 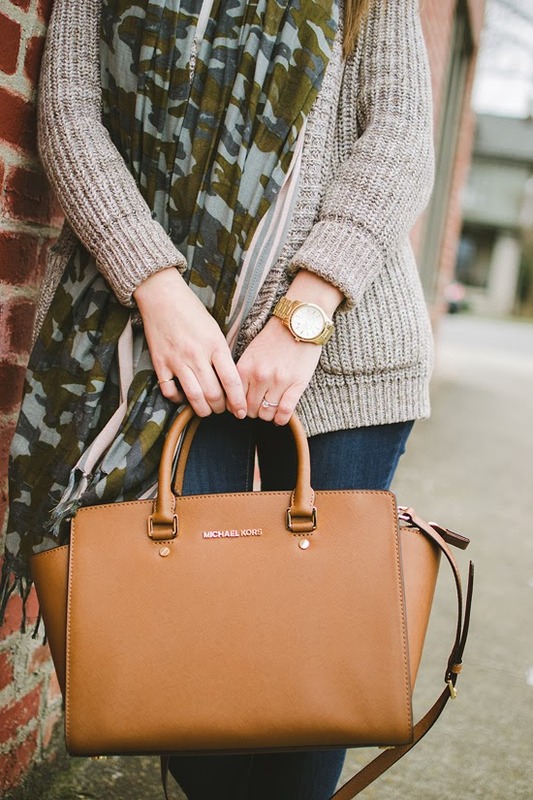 pretty scarf and loveee that bag! Love this look. Very casual and cute. Love the scarf! Everyone is having such great sales and I gave up shopping for Lent! AHH!! Cute, cute, cute outfit! 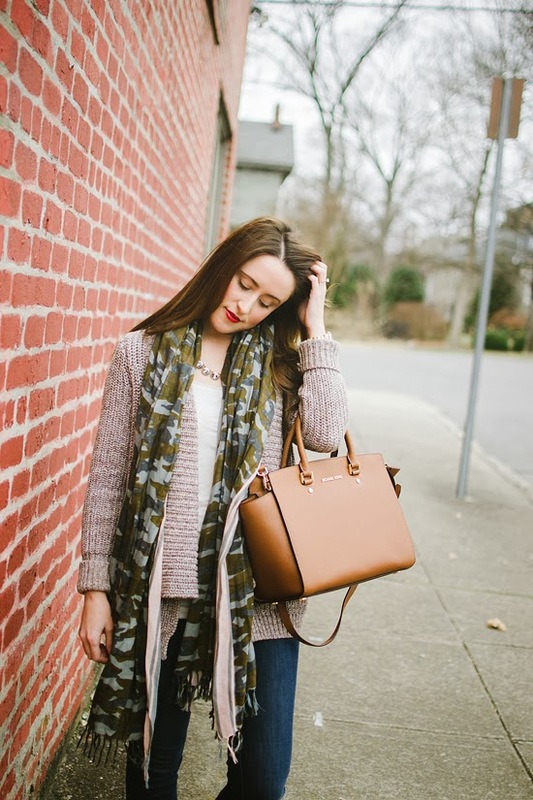 I'm a huge fan of comfy + chic, and I think you pulled it off effortlessly. I need to learn how to work camo into my wardrobe. A scarf is such a nice and subtle way. I'm digging those snake skin flats! Well if that's your "just-have-to-throw-something-on" look then you've nailed it. That's my main goal in fashion. I want to just throw anything on and look fabulous, like I tried harder than I actually did. You've definitely nailed this here Jessica. Your sweater is making me drool. It looks super cozy! I think you did a good job! I hope you got back into your sweats suit, I would have! love the casual cool feel this look gives off! !